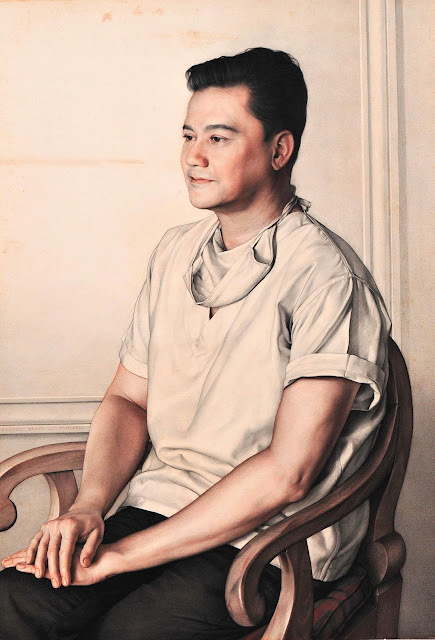 Metropolitan Museum Presents Claudio Bravo: Sojourn in Manila Circa 1968. Upon the invitation of Miss Janette Torral, I went to the Metropolitan Museum in Manila last Saturday, September 22, 2012. It was raining hard that afternoon. It took me more than three hours to reach the place. I had to leave behind my brother in the car to take the LRT. Because of heavy traffic some areas leading to the designated place are flooded. I felt like crying and almost gave up while walking in a semi-formal dress and heels. Inside my mind, I was thinking, I should have wore a more comfortable shoes, pants and shirt instead. It was a long commute, shame on me it was my first time to reach that part of Manila. Some people and guards in the street at Vito Cruz station at LRT1 don't have the slightest idea where Metropolitan Museum is. Having been born and raised in the province, (promdi) it was only this year that I was able to reach the different parts of Manila. ( Thanks to some good people and PR companies who invited me to different events.) Even if my neurosurgeon prohibits me from long-haul air travel at least I was given the freedom to roam around the Metro by foot or by car as long as I have a companion which sometimes I disobey, because of ethics. If the one who invited me doesn't permit a plus 1 then I attend by my lonesome. The strength and good health that God had blessed me with, made me manage to travel by car or by foot around the Metro and nearby places. After intently searching for the Metropolitan Museum entrance, I finally found it. At the entrance, I asked the receptionist for Miss Janet and while waiting at the lobby, I chance upon His Excellency Ambassador Roberto Mayorga of the Embassy of Chile together with visitors from Chilean newspaper El Mercurio covering the exhibit. I excused myself because I am a little wet because of the rain. After I dried my hair, I was ushered to where the action is. I researched about Claudio Bravo and was so impressed with his paintings that I saw on the net, that I was really looking forward ( really excited) to see Claudio Bravo's art works with my own two eyes. Geez! Filipinos ought to go visit the museum all over the Metro every weekend. 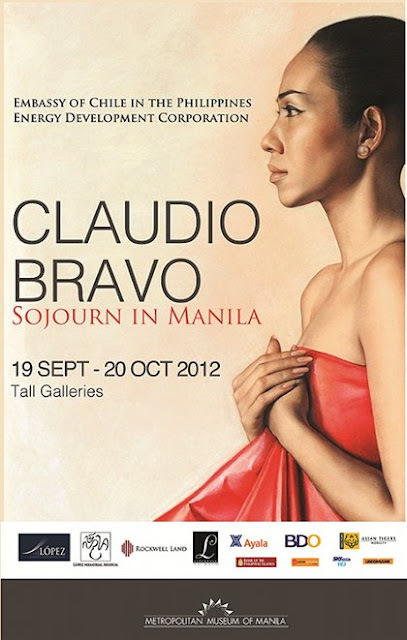 The Embassy of Chile and the Energy Development Corporation (EDC) are the sponsors for Claudio Bravo: Sojourn in Manila, a landmark exhibit at the Metropolitan Museum of Manila. The exhibit commemorates the late artist on the 202nd anniversary of the Independence of Chile.The paintings of Claudio Bravo in the exhibit are those produced during his stay in Manila in 1968. These artworks are the last body of portraits Bravo would ever produce before being catapulted into the international contemporary art scene for the hyper-realist still life that eventually define his career. Claudio Bravo looked back at his work in the Philippines as his “most lucid paintings, because it was a different race –beautiful! ...a different vision of the world and of light." Claudio Nelson Bravo Camus was born in Valparaiso, Chile in 1936 and passed away last year in Taroudant, Morocco. He was a world-renowned hyper-realist painter. Though he was known mainly for his paintings of still life, portraits and packages, I am happy to note that according to Mrs. Tats Manahan he had also done engraving, lithographs,drawings and figural bronze sculptures. He was mainly a self-taught artist though he had taken some private art classes with academic painter Miguel Venegas Cifuentes. Claudio Bravo had his first exhibition at the age of seventeen in his hometown of Valparaíso at the prestigious Salón 13. 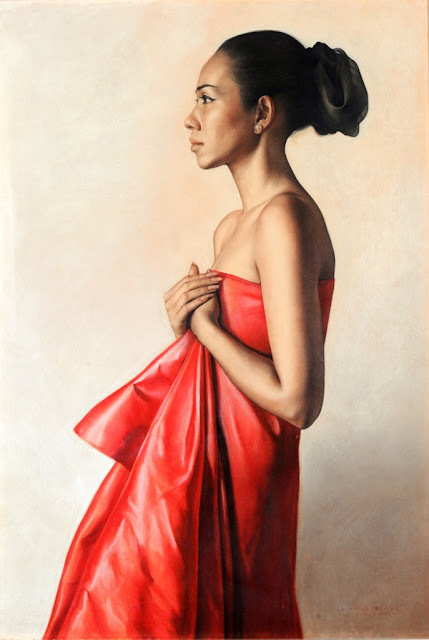 When Claudio Bravo moved to Concepción, he ultimately became a well sought-after portrait painter after a sojourn dancing with Compañia de Ballet de Chile and acting at the Teatro Ensayo of the Catholic University of Chile. For the first time in 44 years, the portraits done by the dime-God in the world of hyper-realist painting, Claudio Bravo are shown to the public. All of the 29 portraits were lent by Manila's luminaries to make the exhibit a reality. Inside the gallery, I was astoundingly amazed at the clarity and the vivid color of Bravo's art. 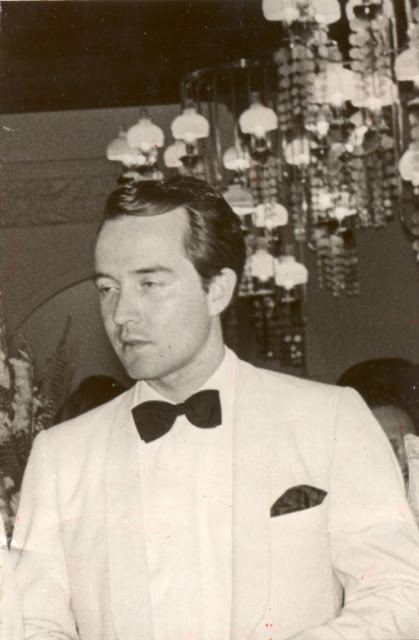 Though he was invited by Imelda Marcos in 1965, it was only in 1968 that the young and impressionable Chilean painter came to Manila, to attend the extravagant 40th wedding anniversary of Eugenio & Pacita Lopez. Bravo eventually settled in the Philippines for almost six months to capture and immortalize Manila's prominent alta sociedad clientele and other leading personalities. 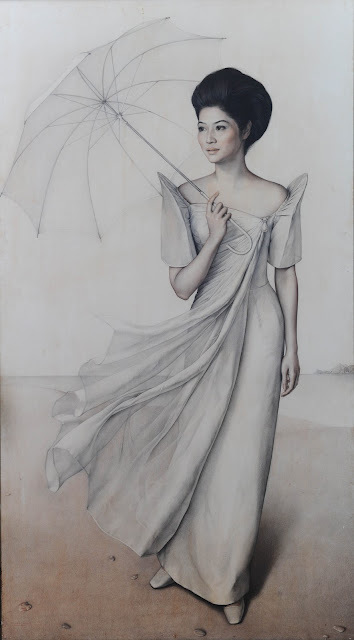 One of my favorite portrait in the exhibit is this 1968 graphite, charcoal, conte crayon and pastel on paper impression of Claudio Bravo of Margarita "Tingting" De Los Reyes Cojuangco. Tingting wore “a Filipina lavandera’s or washer woman’s dress” provided by her mother Lita De Los Reyes and her friend Villa Brille. Claudio Bravo asked Tingting to just let her hair down and sit comfortably by the windowsill to get available natural light. In the final portrait, the simplicity of the sheer kimona top in piña and the woven striped patadyong brought a kind of pastoral innocence to complement her lovely face, another timeless look achieved by the artist.This is how beautiful she is in the eyes of Claudio Bravo. 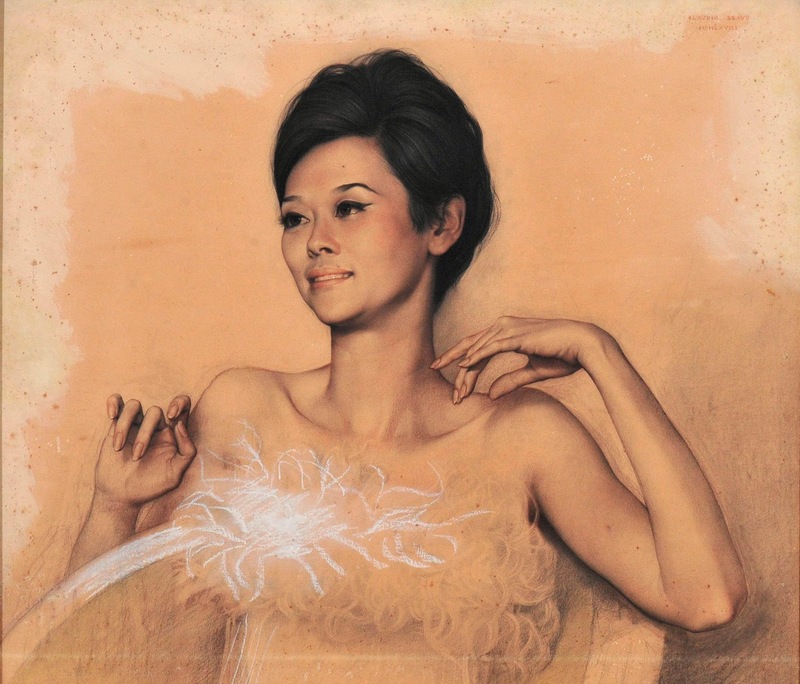 In the artist mind, Tingting possesses not only a beautiful face and body but powerful mind as well, you can see it on how Claudio Bravo drawn her. She exudes confidence. According to the curator, Claudio Bravo never use a photograph. Claudio Bravo work on his subjects for periods of time, even over weeks. 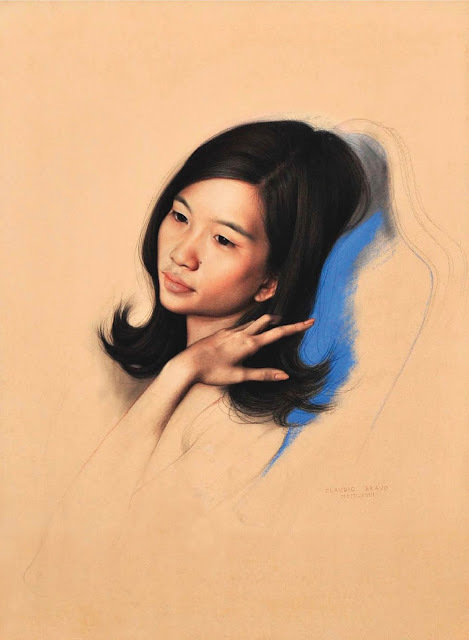 For example, for this portrait, Mrs. Manahan said that Tingting's stand in is the yaya. There was also this painting we saw inside the exhibit with a subject sitting beside his favorite dog. Mrs. Manahan told us the story behind that painting. She said that Claudio Bravo painted the person in this particular portrait for only a week but because the elegant subject's favorite dog, cannot be still for an hour or less he had to paint the dog for two weeks and the subject had to sit in with his dog for that additional two weeks. I find this story humorous and at the same time, I appreciate the love nd patience that the subject had for his favorite dog. Mrs.Tats Manahan dispelled the rumor that Bravo charged an exorbitant rate for his work. The nasty rumor that circulated was that the painter charged for his subjects here in Manila.over US$ 5,000.00 (approximately US $ 25,000-30,000 today). Mrs. Manahan confides that the fee was roughly about US$ 1,500-2,000 at that time, nevertheless still a high and princely fee that only the Filipino wealthy can afford. 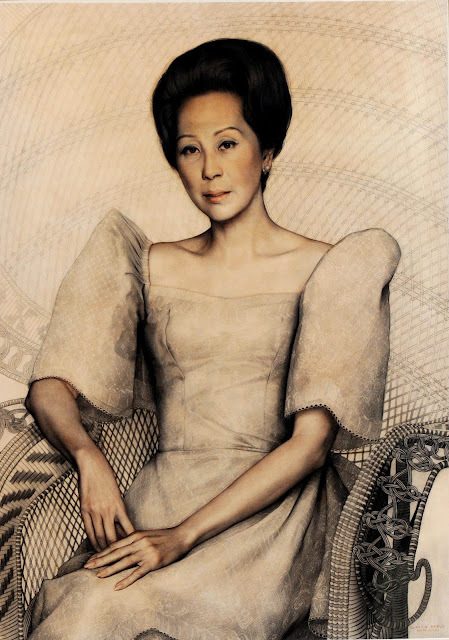 According to Mrs. Tats Manahan, Claudio Bravo conceptualized in his mind a"Chinese lady" even before meeting Regina Dee. So when Claudio Bravo met Regina Dee, he knew she was perfect. He asked her to have a white gown with a black opera coat made and asked her to sit with the coat gathered around her as she adjusted her long white gloves. To complete the picture, he painted ominous clouds billowing in the background. It is said that the painter asked his dutiful subject again "to be dramatic". Bravo, as Manahan points out, had an instinctive flair for "styling". He personally select their clothing and tell them what pose to make. The exhibit's curator, Mrs. Tats Manahan, told us that in 1961, Claudio Bravo moved to Madrid and continued to work as a portraitist to high society. 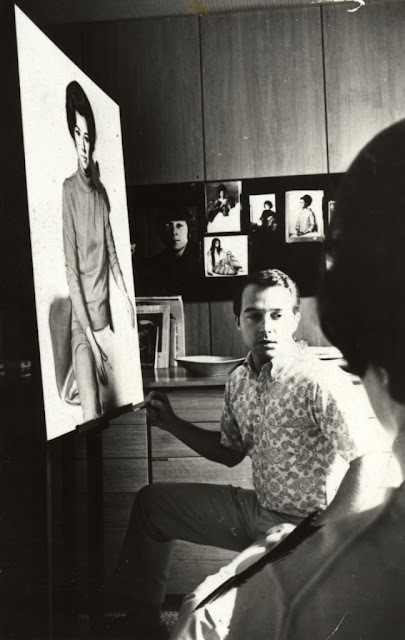 During the following decade, he painted many famous and powerful people, including the daughter of General Francisco Franco while in Spain, and the Lopezez, Ferdinand and Imelda Marcos during a trip to the Philippines. "I don't want to betray myself. I have a very special talent to copy the reality, and I have tried many times to do another kinds of painting, but my friends - great painters - told me "don't be mad, you have a gift from Heaven which nobody else has." I copy a different reality, I re-invent it, just follow my gifts. Why would I betray myself by doing another kind of painting and following the others? I like being myself, not being like anyone else, so the only way is following the gifts that God gave me. I paint reality, and as it's full of mistakes that I don't like, I correct it." On a visit to Tangier in 1972, Bravo fell in love with Morocco. Bravo was "fascinated by the composition of things in the country," and was "mesmerized by the use of color in every day life." He adopted Morocco as his new home. Because he got so inspired by his new surroundings he began expanding his subject matter from portraits he devoted more time to allegories, landscapes, and the usage of a brighter color palette. The popularity of Claudio Bravo's particular paintings made him extremely prosperous. "The success of my pictures exceeds all my dreams," said Bravo. "I never thought that I was going to be so famous, so expensive. I never thought that I was going to have presidents, kings and ministers knocking at my door." His financial success freed Claudio Bravo to choose his own subject matter, and only take the commissions which interested him. It also enabled the artist to live like the royalty he painted, maintaining an apartment in New York City and three palaces in Morocco. The Philadelphia Museum of Art, Philadelphia, Pennsylvania. Claudio Bravo lived and worked in Tangier, Morocco from 1972 onward. According to the exhibit curator Mrs.Tats Manahan, prior to Claudio's visit in the Philippines he doesn't use color in all his paintings. Mrs. Tats Manahan was happy to note that Claudio Bravo started experimenting the usage of color palette only in the Philippines. 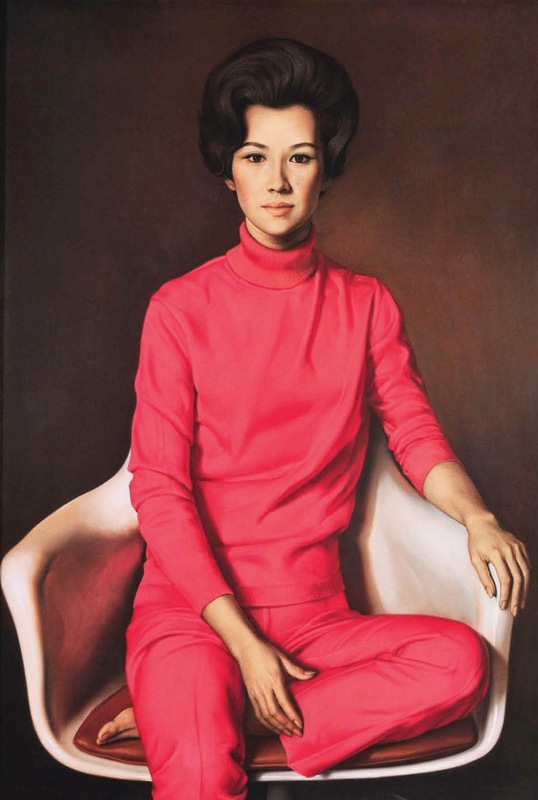 Conchita Lopez Taylor as painted by Claudio Bravo. Image from the Metropolitan Museum of Manila. 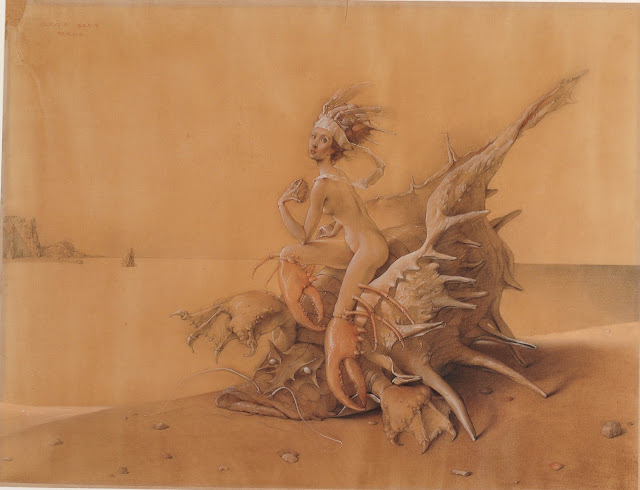 "Venus pudica" pose by Baby Araneta Fores in Claudio Bravo's eyes. This is a pose of shame. But in Claudio's interpretation this is a proud pose. With her chin up and Red dress the usual pose of shame become a pose of a person in power and control. Elvira Manahan was the only one captured by Claudio Bravo smiling among all the portraits he had done in Manila circa 1968. For Elvira Manahan’s pose, her fingers can be seen playfully gesturing very typical of her bubbly personality. Elvira was so animated, in fact, that Bravo never completed her portrait because she kept talking and moving about during the sittings according to Mrs. Tats Manahan. The exhibit will be accompanied by weekly activities on Saturdays, including a curator’s talk, portraiture lecture and a drawing session. 1. September 22 - Portraits of Distinction. (2 sessions) 9:30am-12nn; 1-5pm at the Upper Level Bridge. 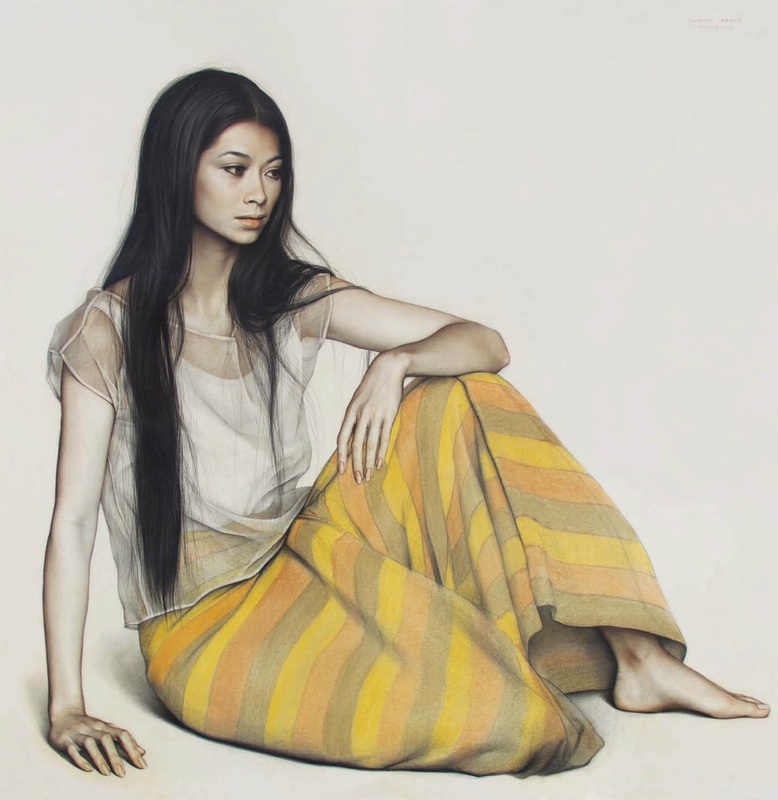 Two contemporary Filipino artists spearhead a portrait sketching for artists with distinguished or accomplished Filipinos as sitters. William Gaudinez conducts the first session in the morning while Rafael del Casal facilitates in the afternoon. 2. September 29 - A ‘Still’ Life talk by Cid Reyes. 10:30am at the White Cube Gallery. Art historian Cid Reyes talks about still life painting tradition in the Philippines. His survey on the subject and still life painters in the Philippines will be followed by a still life drawing/painting session involving objects often used by Bravo in his drawings. 3. October 2 - Fashion Portraits: inspired by Claudio Bravo. (2 sessions) 9:30am-12nn; 1-5pm at the Upper Level Bridge. Drapery sketches have been one of the most exquisite creations of Bravo. ‘Draped’, in cooperation with Summit Media, features the leading stylists in the country on a draping exercise which will be followed by a sketching session of the styled models. 4. October 6 - Bravo Claudio: Curator’s Talk by Tats Manhan. 10:00 am at the White Cube Gallery. 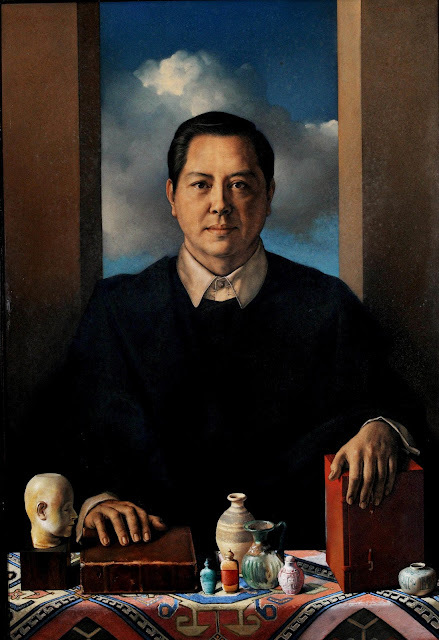 Tats Manahan will discuss the life and art of Claudio Bravo with emphasis on his connection to the Philippines in 1968. This will be followed by the curator’s walk through of the exhibit. Entrance fee: Php100 (applies to all ). OMG he is so good! Those drawings looks so real! Can't even choose which one is my favorite lahat magaganda, super galing! I always "like" to draw but drawing doesn't want me.. hehe. WOuld love to see his works with my bare eyes! sophisticated woman knows how to appreciate art and literature, and you are one of those women. I'm very honoured to know you.. Well, I hope that we can hangout together in the next art exhibits.. Cheers! GREAT POST... ang gaganda lahat, would like to see his works w/ my bare eyes..
Super beautiful paintings! I should go and see these paintings before the exhibit ends. Claudio Bravo is a great artist. I wish I can have one of his works. Even a replica will do. Is that possible? The poignant sketch is pregnant with emotions I would love seeing in one of my home's wall. Oh my! I was surprised to see my picture included in your post. I am superbly flattered (to the bones). hahahahaha. Thanks so much for your wonderful company helping me go home as I am once again lost (severely disabled in locating directions). Anyway, my favorite portrait is of Regina Dee. I remember Ms. Tats saying that Bravo wanted to paint Mrs. Dee with drama and indeed she looked quite dramatic in her painting. It just surprised me that Mrs. Dee didn't think she was dramatic at all. Maybe she was really shy as Ms. Tats described her. I can't relate to this post because it's all about the elites. 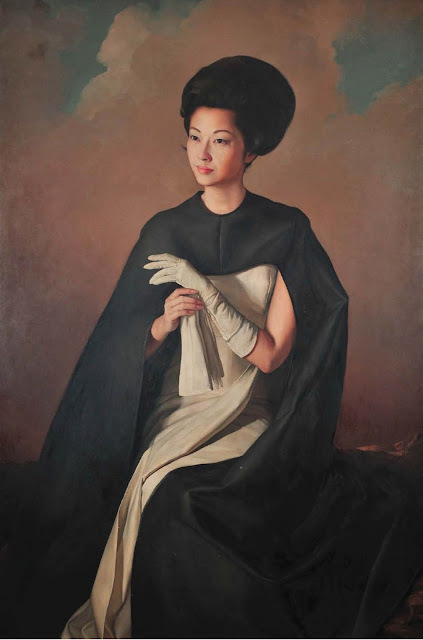 But Imelda Marcos' terno portrait is timeless. Claudio should bring the exhibit to Cebu and put his gallery all over Casa Gorordo. The portraits look haunted.